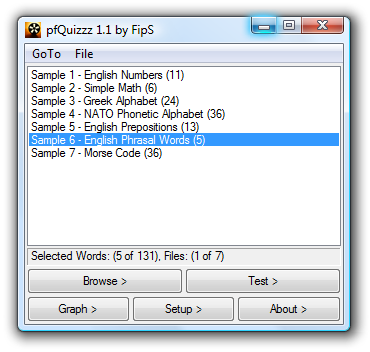 pfQuizzz is a freeware vocabulary trainer for PC, PDA & Mobile. If you need to drill thousands of words to learn a foreign language, this tool is exactly what you are looking for! In just a few minutes a day you will make huge progress. Once you have managed to learn all the words pfQuizzz will help you retain your knowledge. 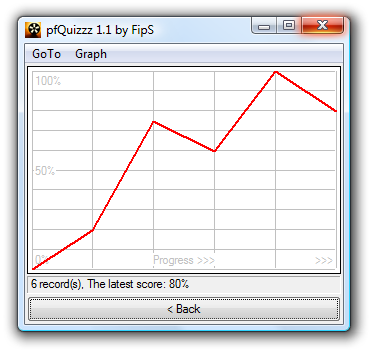 For freeware site owners, the PAD file for pfQuizzz can be found here. If you find pfQuizzz useful, please consider making a donation. A payment might be done through PayPal using either a PayPal account or a credit card. Thanks! Another way you can help to support pfQuizzz is to visit the sponsored links on the right side, which might be of interest to you. Or just encourage the author in his future activities by saying Hello! and dropping a few lines on the pfQuizzz Community Forum. Thank you All! If you want to be in touch with other pfQuizzz users and share their experience with the program or perhaps have something to say to the author, the pfQuizzz Community Forum is the best place to visit. Feel free to ask anything; Is there a feature that you are missing in the program? Have you any technical difficulties? Just write it there! You might also find someone to share your vocabulary files with. Pocket PC 2003 SE: The range of supported mobile devices has been extended to the older generation of Pocket PC 2003 SE. Layout: The layout management within the Test Screen has been improved. Now it can deal with extremely low resolutions / areas. It's useful on mobile devices when the virtual keyboard is visible and no much screen space is available for pfQuizzz at the same time. FIXED: If no data files have been created yet, some of the GoTo menu items might be set to an incorrect state in some situations. Selecting such an item can lead to program crash. FIXED: The list of data files in the Home Screen isn't always properly sorted. FIXED: The 'General Font Size' option is enabled on mobile devices (Actually, it should not be). 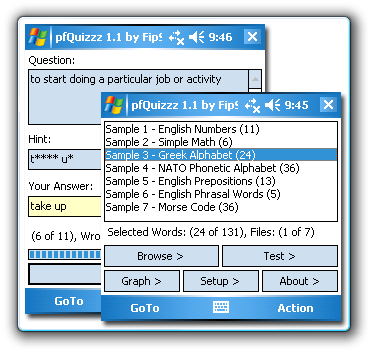 Mobile: The initial version of pfQuizzz for Windows Mobile 5/6 has been finally released. Variable Font Size: It is now possible to change the size of the application font and make pfQuizzz friendlier to people with impaired vision (it is also useful when the screen projector is used). There are 3 font sizes to choose from (Normal, Large and Extra Large). The setting is available under the Setup Screen (F9) / 'General Font Size'. Custom Font: The font used to render all the user data can now be freely changed. All aspects of the font can be controlled including the character set. The setting is available under the Setup Screen (F9) / 'Use Custom Font'. Progress Bar: Newly, there is a progress indicator in the Test Mode (F7). It gives quick visual information about the exact stage of the currently running test. Single Key Browsing: In the Browse Mode (F3), it is now possible to easily expand / collapse answers by repetitively pressing just a single key (Enter / Space key or the centre button on Windows Mobile). It's extremely effective in the learning period especially on mobile devices. Open Folder: The folder where all the user data files are stored can now be quickly accessed in the Windows File Explorer for further manipulation or backup. The 'Open Folder' function is available in the Home Screen (F1) under File / Open Folder (F6) or in the context menu (through the right click). Multiline Questions: Questions that are too long to fit a single line in the Test Mode (F7) are now automatically broken into multiple lines so complex questions can now be displayed in a pretty compact way without the necessity of scrolling or resizing the application window. Minor Changes: Faster UI updates in certain situations. Improved layout manager (better support for both extremely small and big resolutions). Some minor changes in texts and labels. FIXED: While pfQuizzz is minimized, message boxes are being shown in the top-left corner of the screen (normally, they are centred to the application). 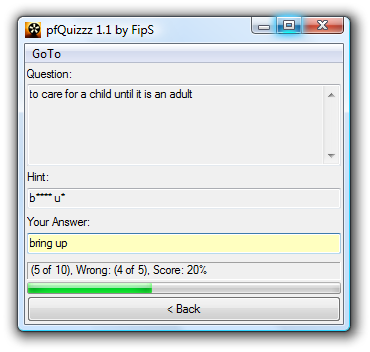 FIXED: The content of the question box in the Test Mode (F7) gets selected when pfQuizzz receives the focus (e.g. after Alt+Tab). FIXED: The Windows system folder is always expected to be here: 'c:\windows\', which might prevent pfQuizzz from executing external applications. FIXED: When the Browse Mode (F3) is activated, sometimes the top item is not in the visible area. The same applies to the expand / collapse buttons. FIXED: After selecting all the items (Ctrl+A) in the Home Screen (F1) the item state is not properly updated. FIXED: The Data Folder in the Setup Screen (F9) sometimes shows invalid data path.